Skip any queues and save time. With VeniceBox you get into the main attractions without standing in line. Even to move around: no more endless lines, just get on any water or city bus. Time is your most precious asset. You can move around freely, without having to think about tickets and routes: from the moment you arrive, just start taking in this splendid city. Make the most of your Venetian vacation! Transport is already included, as is admittance to the main museums. What's more, with over 50 affiliated stores and restaurants where to buy souvenirs, grab a bite to eat or wine and dine – make your stay among the canals of Venice unforgettable. A complete package to visit the city. VeniceBox gives you the most up-to-date map of the city with all the landmarks, useful phone numbers and attractions of Venice. Discover even the remotest of alleys, the hidden treasures, the quaint little corners that make this city unique in the world! plus a super coupon worth over €50.00! Venice is a unique city: live it uniquely! VeniceBox is the only solution that lets you have everything you need to visit Venice without wasting any time or spending too much: from restaurants to stores, from public transport to the local museums. With VeniceBox you can choose the solution that best fits your vacation. I received everything in time and once in Venice it was so easy! Much more than a citypass! I looked around for packaged solutions, but only Venicebox granted a complete package with everything in my hands before leaving from home. That changed the way of visiting Venice: complete relax and no waste of time. I needed a custom package and I am not very good with internet: they supported me in all steps. I had to arrange my holidays in few days and had no time for organization. Buying VeniceBox was easy as a click, and once in Venice I had everything with me. I planned to arrive in Venice by train, and the collecting point was very close to the station. Once I had my VeniceBox with me, everything was very easy. I was surprised once received VeniceBox: it is a design package and inside I could find all the services I bought. Much more than a city-pass. VeniceBox saved me from Venice mess! I've been in Venice many times: it is so romantic but very complicated. I decided to use VeniceBox and once in Venice I was so proud observing people wasting time in queue almost everywhere. Art, culture, shopping, dining ...whatever your vacation may be based around, there are benefits in it for you! Save time by skipping any queues. Time is most precious when you're on vacation. With the VeniceBox passes you can skip the line at the water-bus stops, because you already have the ticket! Not only. When you get to one of the listed museums, you need not stand in queue to buy tickets: skip the queue and be admitted straight away! And even at temporary shows, VeniceBox makes it so you can skip the lines. Because, for us you are a VIP! With VeniceBox you get a public transport pass, and discounts at all of Venice's most prestigious affiliated shops and restaurants. And by buying the museum option with your package deal, you start saving up to €60.00 right away. 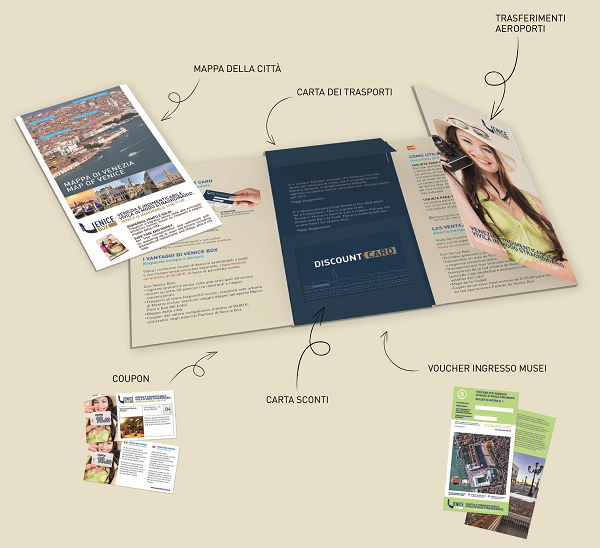 The package also gives you coupons to use at affiliated stores. The coupons are worth €50.00 overall. without restrictions, for the validity period of your pass. Get in to see the most prestigious museums of the Saint Mark circuit. They are most famous in the world and are visited by millions of tourists every year: The Ducale Palace, the Correr Museum, the National Archeological Museum and the Monumental Rooms at the National Marciana Library. These are all included!!! You also get a handy city map. There are no cars in Venice. So, besides the thrill of water-busing your way around the canals, the only other way to see the sights is on foot. The handy, up-to-date map helps you navigate your way around easily and surely. Also our mobile app will show you all of the affiliated establishments where you can make the most of you package deal. Several different package deals are available: choose the one that best fits your needs, depending on what you want to do and how long you are going to stay! Buy it now: you have 12 months to use it. You get a host of benefits: restaurants, stores, museums, parking, photo shops, souvenir shops, and so on. 2. Collect and activate VeniceBox. 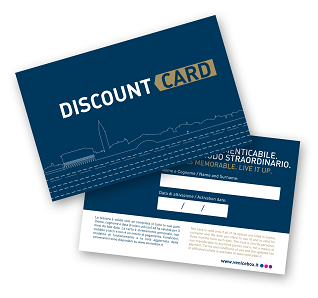 THE DISCOUNT AND AFFILIATE PASS. On the back of you pass, write your name, surname and the date in which you plan to start using the transport pass. The discount pass will be valid for three months from that date. THE TRANSPORT PASS. The transport pass activates automatically when you first use it. 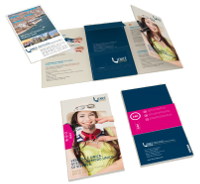 Its validity is specified on your VeniceBox package. THE MUSEUM VOUCHER. If you buy the museum package, the package will include a voucher to admittance to museums. Just show it at the ticket office to collect your tickets and to be admitted. And, without standing in line. If you arrive by car: take advantage of the affiliated parking. If you arrive by train: just hop on a water-bus to go straight to your hotel: public transport is always included! Skip any queues at the water-bus stops, at any time. No worries! If culture comes first for you: go straight to a museum without having to stand in line. If, however, shopping is your thing: there are over 50 affiliated establishments where you can buy the best souvenirs for your family and friends. If you want to savor Venice's typical recipes: choose one of the many affiliated restaurants. You'll save up to 10%. MUCH MORE THAN JUST A PASS. VeniceBox is a complete package comprising everything you need to enjoy the city. Free admittance without standing in line at the city's best attractions: the Ducale Palace, the Correr Museum, The National Archeological Museum and the Monumental Rooms at the National Marciana Library. All included!!! Transfer from Venice or Treviso Airport to Piazzale Roma (go and back). You get discounts at over 50 affiliated stores and eating establishments. Transport is included: on all of the city's water-buses and land buses in Mestre, for the entire period of validity on your pass. In total, in a three day-vacation you can save up to five hours!!! Wouldn't you rather spend the time enjoying yourself? With VeniceBox you've already saved half a day of your vacation time! But, best of all, you can save lots of MONEY. (*) the values are calculated assuming you have one meal per day at an affiliated restaurant, plus three water-bus trips per day, less than two museums/attractions per day. Set up you trip and your transfers by making the most of all that VeniceBox has to offer. Trace your route, see where the main attractions are located and where the affiliated stores can be found, and in so doing start making the most of VeniceBox. Otherwise, just let your instinct guide you, and wherever you are, check to see what's around you that you can benefit from. With VeniceBox you can decide at the last minute, as public transportation is always included! Here you can find all of Venice's attractions, the affiliated establishments, the museums … to find out all the details, to have up-to-date information before you actually move, contact them to book or simply to find exactly what you are looking for or that which is nearest you. Starting from January 2019, a new collecting point will be available in the heart of Venice, close to the famous Rialto Bridge. 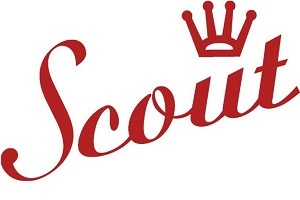 It will be hosted by our partner "Scout" in Calle dei Botteri. VeniceBox collecting point is now closer to Rialto, still remaining in San Polo area, and can be reached in 15 minutes walk from Piazzale Roma or from the railway station. Closer to the hearth of Venice! VeniceBox will be presented at AO Hotels Network day on November 10th 2017 in Mestre (Venice).